My introduction to The Mountain Goats came about thanks to a friend of mine who quickly became obsessed with their folky, poetic goodness. A few listens and a concert attendance later, I was a convert. John Darnielle’s sweet, nasally voice had made me a fan. A Goater, if you will. 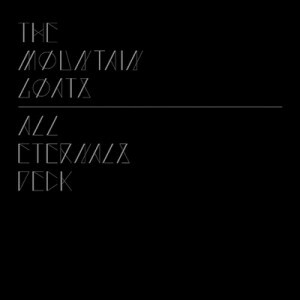 So it’s rather serendipitous that the first review album to drift my way was The Mountain Goats newest release, All Eternals Deck. Liner notes explain that the fictional All Eternals Deck is a set of tarot cards, generally more hopeful than its counterparts. This deck, supposedly, allows for “cheerful interpretation”. The album, not so much. Opening with the leading single ‘Damn These Vampires’, we are assured that the pervasive melancholia typical of Darnielle’s lyrics isn’t absent on this album. Happily, the worrying presence of the word ‘vampires’ in the title doesn’t reduce this opener to some sort of capitalisation on the recent surge of interest in vampires and their attractiveness, instead affirming that these guys largely have catchy (and deceptively up tempo) sad songs down pat. From such promising beginnings comes a lull which unfortunately comes and goes throughout the album. Yes, the lyrics have bursts of the striking poetry which Darnielle is famous for, but the stories in each song don’t quite come together, or seem to be just revisited versions of older songs: ‘Sourdoire Valley Song’ is at least the band’s second song inspired by the discovery of ancient, fossilised humans. That being said, the album has clear highlights. The backing vocals in ‘High Hawk Season’, provided by the North Mountain Singers, blend perfectly to create a beautifully harmonic call to arms, while ‘Outer Scorpion Squadron’ exemplifies why people like me regard Darnielle as a skilled poet, and one of the best lyricists around. His ability to weave images and emotions is further proven in the Australian-only bonus track ‘Brisbane Hotel Sutra’, which almost serves as an epilogue to 2005’s highly personal The Sunset Tree. This last track rescues what would have been a disappointing last few songs, like the overly optimistic, cringe-worthy lyrics in ‘Never Quite Free’ (“It gets okay to praise the day” one such killer rhyme) a definite low point. At times it seems as though you’re idling through a largely standard song collection – a feeling which is probably partially caused by unfair expectations of nothing less than brilliance – but when you do reach those standouts, they are truly remarkable. With some songs sure to become crowd pleasers and others destined to divide listeners, All Eternals Deck isn’t solid gold, but it certainly has its glimmers. This entry was posted in Arts, Music and tagged all eternals deck, john darnielle, the mountain goats. Bookmark the permalink.